The latest graphic novel from Doug TenNapel proves once again that a full story can be told in pictures, and that it can be as affecting and detailed as it could be in book form. Though not as delicately handled or as deeply moving as Ghostopolis, his last offering, Bad Island is fun, charming, intricate, and complex. It’s the story of a family that goes, against their will, on vacation together in an attempt to fix the problems they’ve been having. This is a common set-up for a superhero book, but these characters stay as human as they were at the beginning, which is a refreshing change from expectations. A storm comes and washes them up on an uncharted island, where it seems as if everything is evil and out to get them. Their story of survival is also the story of how the island got there, and how they help it get back where it belongs. This is a charmingly weird story about a truly bizarre family vacation, and if the kids are brats at the beginning, the love between the members of this family is more than evident by the end. All the characters grow enough to make the story worth reading, and the complexity of the story makes it ideal for teaching kids about drawing conclusions and keeping track of plot points. The island itself is a fascinating invention—living and mechanical, sentient and in need of inhabitants at once—and finding out its back story is almost more interesting than seeing what happens to the family washed up on it. 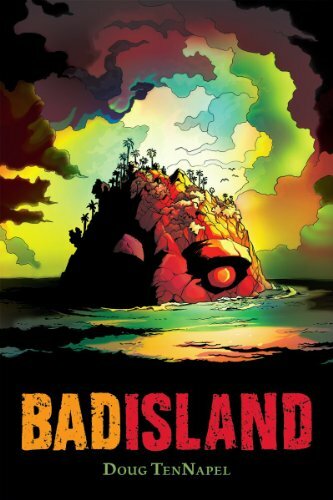 Bad Island does, on occasion and from an adult point of view, read a little rushed, but the story is aimed at children on the younger side of Young Adult, so the details an adult might like to see (the family dealing with the younger sister’s weird attachment to a dead snake, for instance) might not matter for the target audience. It’s a simple story, but it doesn’t read as simplistic, and the combination of funny and terrible makes it an addictive read. The action is exciting, the drama is real, and the weirdness makes every page the sort that you show to whoever is sitting next to you. The art is gorgeous and horrifying in turns, and a bit reminiscent of Hellboy or something like it, so it’s a good lead-in to the better sort of adult graphic novels. It’s a book that deserves to be shared—and holds up well to rereading.